The Rockport Film Review: "Broken" One of the best Unseen Films of 2013! 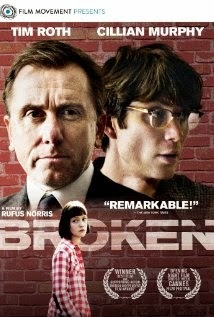 The British independent film "Broken" broke through in the UK in 2012 with a quite a splash, winning a number of awards. The film, however, has sort of flown under the radar as it wasn't released in the US until last Summer by Film Movement. Its the dramatic coming of age story of an 11-year-old girl affectionately named Skunk. She is played by first-time actor Eloise Laurence, who gives a remarkably real and thoughtful performance. This is also the first feature film for director Rufus Norris. Skunk lives within a cul-de-sac in suburban London with her Dad Archie, played by Tim Roth, and older brother Jed. Her mother ran off with another man years back. They have a live-in nanny, Kasia, who serves as a sort of mother or big sister figure. Cillian Murphy also puts forth a strong performance as Mike, Kasia's boyfriend, and Skunk's crush. The stories of the three families within the cul-de-sac are all compelling and well integrated into Skunk's world. We open with Skunk talking to Rick, an older friend but mentally unstable neighbor, who out of nowhere get a savage beating from Mr. Oswald, the fiery father of a trio of foul-mouthed daughters who are also without a mother. Adding to the many difficulties of adolescence, Skunk also has diabetes. She could be bitter and angry about her situation but is very resilient and strong. She is adventurous, inquisitive and full of wonder, whereas the girls next door are petty, vile, and just plain unpleasant. The two families are dealing with a similar issue in very different ways. While the third family, Rick's Family, tries to keep to themselves and protect their son from the world. Rick is a volatile man-child. He has a gentle and sweet exterior that fights with his inner rage and turmoil. After becoming too much of a handful for his parents to deal with he is put up in a hospital. Skunk see the good in him, the longing to be normal and accepted. The final 30 minutes will keep you on the edge of your seat with an intensity that is hard to find. I know that sound a little clichéd, but the filmmakers took such care in developing the story and building its characters that the ending just works on every level. You won't be disappointed. And It's currently on Netflix Streaming so you have no excuse.